Furniture of America cordially invites you to the Winter Las Vegas Market as we introduce our brand new 2017-2018 Catalog with hundreds of never-before-seen products. Join us for hors d’oeuvre, cocktails, and giveaways at B1168 in the World Market Center, Las Vegas from January 22 - 26, 2017. 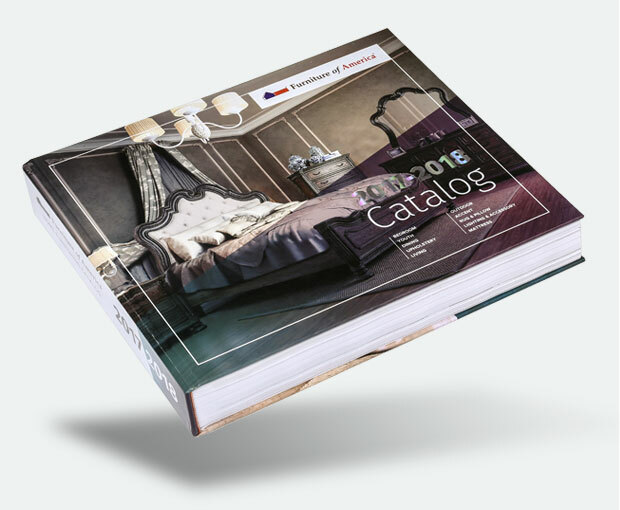 Our brand new catalog for the next year will make its debut at the Las Vegas Market. Be among the first to get their hands on our beautiful 1,000-page catalog. Also, get an exclusive look at the products that are coming this year, as our friendly associates will be in our showroom eager to show you the latest from FOA. Our Customer Appreciation Raffle is back! One lucky grand prize winner will get his or her market order for FREE up to $10,000! The 2nd and 3rd prize winners will get up to $2,500 and $5,000 market order credit, respectively. Winners will be drawn on Tuesday, January 24, but winners do not need to be present at the time of drawing to win. Only orders placed during the show are eligible. Visit our showroom for more details. Come and grab your very own FOA Panda plushy and other giveaways. As usual, lunch will be served Sunday through Tuesday, with hors d’oeuvre and cocktails available at the bar throughout the day. We look forward to seeing you there, and let's make this the biggest Market ever! This entry was posted on January 10, 2017 by FOA Team.